CyberCrabZilla is out to kill John Difool! Another scan from the 80’s issues of Heavy Metal magazine, this giant cyber-mecha-crab attacked poor John Difool while on the run from the Techno-Technos. We ran into this beastie in a D&D Gamma World game recently. It was big and scary and only the fusion rifle that our Empath Hawkoid has been keeping just barely cobbled together kept us from being TPK fodder for the beast. 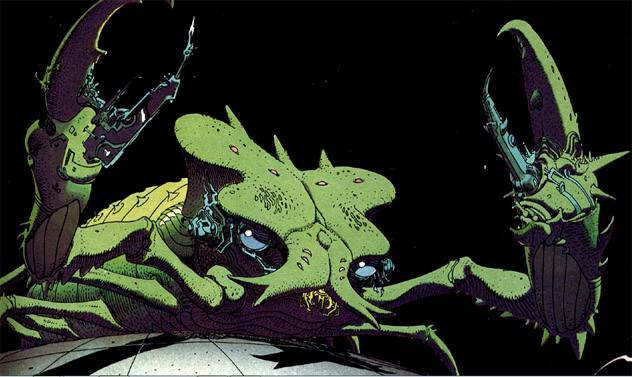 This enormous mutated crab has been modified by a Marine Biologist AI into a machine of destruction. It prefers to attack in close with it’s massive pincers, but uses it’s built-in energy bolt projectors when needed (although they take time for the capacitors to recharge, restricting it to one blast every 3 rounds with each projector). The cybernetic modifications have also completely blocked pain reception, so once ordered to attack, CyberCrabZilla attacks to the death, unaware of its own injuries. And an update on my computer crash – managed to reinstall windows, and now my scanner/printer refuses to get along with the damn laptop. Might have to reinstall Linux on here with multiboot just to be able to scan my maps again. Love it! And a great illio you found for it too! I’ve actually posted one post-apocalyptic environs hexmap, as well as one post-apocalyptic mini-adventure here, and plan to post more in time. Oh man, seriously? I’ll have to dig around and find it then. There’s probably a ton here that I’ve still not seen… 🙂 Thanks Dyson.